Buttermilk is one ingredient I only started using more often thanks to Dorie Greenspan. Some of her recipes have called for it and of course, it's only a small amount. What am I going to do with the rest of it? Thankfully there's a few recipes I've been able to use it in. One easy way to use up buttermilk is as a marinade for chicken and even pork. Many folks are probably familiar with 'buttermilk chicken' but the same idea works perfectly well with pork chops too. To add some flavor, I added some dried oregano, thyme and minced garlic to the marinade and let it chill overnight before browning and finishing off in the oven. The result? 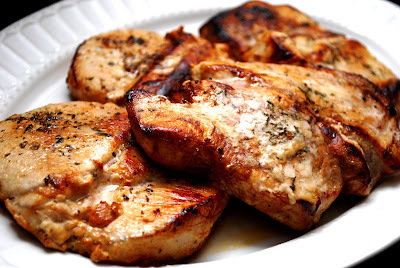 Flavorful, juicy pork chops! Season your pork chops with salt and pepper; place chops in a gallon sized zip top bag. Add the remaining ingredients and place in the fridge for 4 hours to chill (or you could chill overnight too.) Remove the pork chops from the bag and pat dry. In a hot skillet with 1-2 tablespoons of olive oil, brown your pork chops on both sides. Once browned, place the pork chops on a baking sheet and bake in the preheated oven for 7-10 minutes. Don't over cook otherwise it will result in dry, tough pork! I served this with parmesan & parsley orzo and roasted caprese tomatoes. I'd never heard of a buttermilk marinade before, but then again I don't get out much!